This unique mother's birthstone necklace is a precious way to show off those who are special to you. The sterling birthstone drops will be personalized with initials and birthstones you choose. 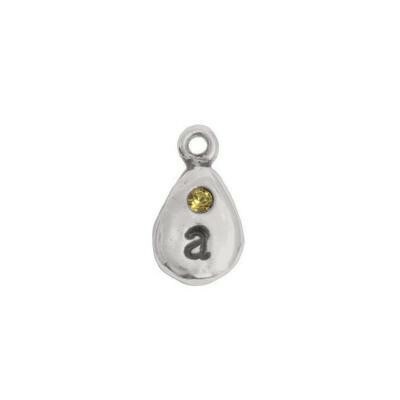 We can add one initial and one swarovski crystal to this sweet charm. Stones are 2mm in size. Initials only come in lower case. My most recent purchase was excellent. No problems with placing and receiving order. However, about 2 1/2 years ago, I received the original gift of the necklace plus four birthstone droplet charms. I just noticed when I was putting on my new charm to the necklace, two of droplet charms are missing the birthstone. Is there anything you can do about this. The charms are September j; November d.